Traders were caught off guard on Wednesday September 15, 2010 when Bank of Japan intervened in the foreign exchange market. It was a surprised action. It had been over six years since Japan intervened in the foreign exchange market. 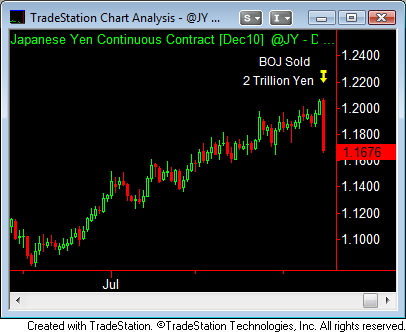 The yen plummeted that day as Bank of Japan sold nearly 2 trillion yen ($23 billion) against the United States Dollar. The Japanese Yen had been steadily rising during the four previous months and the currency appreciation was hurting the Japanese exporters. Political pressure from large corporation such as the automotive and electronic industry was mounting. After the yen continued to make six new 52 weeks highs, the Japanese government decided that they had enough and took unilateral action in the FX market. Japan's Prime Minister and Ministry of Finance, Yoshihiko Noda, decide on the country's currency policy. After which, the Ministry of Finance uses Bank of Japan to execute their currency strategy which includes the timing of the intervention and the levels that will trigger a response for further intervention actions. 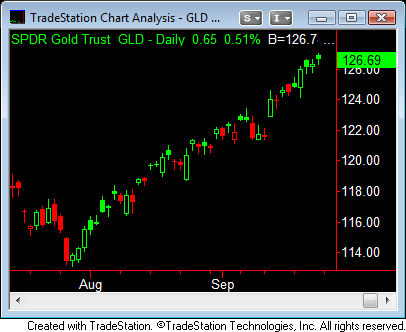 Using mosaic analysis, I am able to piece information together to form a likely trading scenario. It is much easier to weaken one's own currency than defending it. Japan wants to weaken its own currency. Bank of Japan is empowered to print yen just like the Federal Reserve did when they turned on the printing press to rescue the financial system. Governments are allowed to print money out of the thin air. BOJ prints the yen and sells it in exchange for the US Dollar. What will they do with the influx of US Dollar? Where will they put it? They can use it buy Euro and Gold. I suspect traders are already anticipating this and are running ahead to accumulate Euro and Gold. Traders are counting on Japan to be a buyer for Euro and Gold. Japan had indicated Wednesday currency market intervention was not a "one and done" deal. They will intervene again if necessary. To put this in historical context, Japan had intervened in the FX market for a period that lasted until 2004. Before they were done, they had spent 35 trillion yen. Wednesday's 2 trillion yen is just a tiny fraction of what BOJ is capable of spending. The flipside of potential 35 trillion yen selling program is that they will receive a huge influx of US Dollar. The US Dollar will have to go somewhere. Why not into Gold and Euro? When the technicals match up to the fundamentals, that gives you the confidence for getting aggressive on positional trading. My last month's thesis proves to be correct. Both Gold and Euro has gone up. 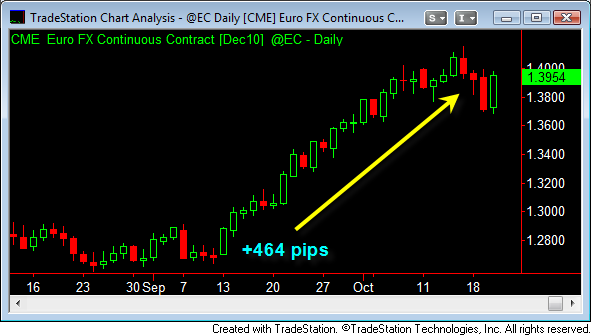 The Euro has gone up more than 464 pips. 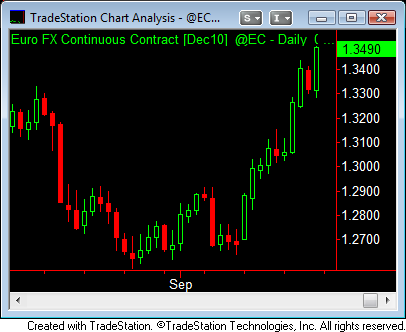 The Euro currency did a two day running profile. The price action of the previous day didn't feel like traders were whacking the bids. It felt more like traders were pulling their bids after a few contracts got filled. The lack of liquidity exaggerated yesterday's sell-off in the Euro currency futures. Today, the traders step back in on the other side and lifted the offers, erasing almost all of yesterday's loss. Bullish Bias is maintained. Your "I know this is where I am wrong" is $1.3719. If a bullish bias is to be correct, price cannot pull back to $1.3719. Look for signs of A-Up, to prove bullish mood is still in effect.